Ivy's dashboard gives you a full overview of your active projects, including your total revenues, total hour billed, overall revenue from markup, and more! Allowing you to get up to date with your business at a glance. The "Project Revenues" section shows you the breakdown of total revenues (planned and actual) across all open projects. This includes both revenues from invoices as well as proposals, however, you can see the breakdown between the two by clicking the "?" icon. The "Hours Billed" section shows you the breakdown of total hours billed across all open projects. 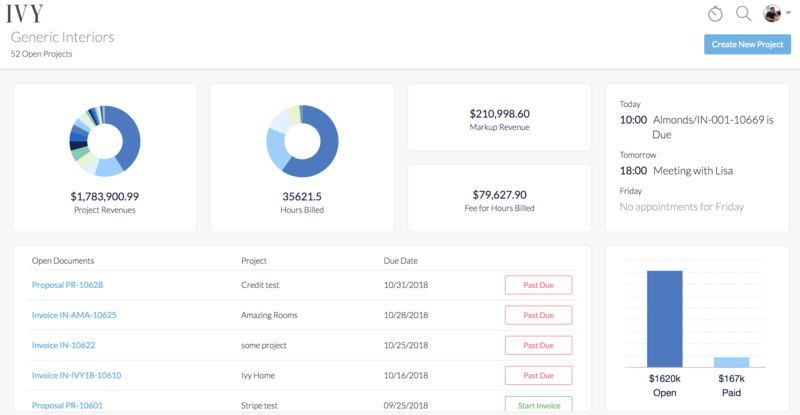 This allows you to understand how many hours have been billed per project, and also gives you a better understand as to which project's are taking up the majority of your time. The "Markup Revenue" shows you the total revenue (planned and actual) generated from markup across all of your open projects, while the "Fee for Hours Billed" shows you the total billable cost of hours logged across all your active projects. You can get an overview of your next two days directly in the dashboard, making it easier to understand what To Do items you have due, or what scheduled events/meetings you have planned. You can also see a full list of your To Do items and your calendar events by going to the "Plan" icon on the left hand navigation panel. Looking for a quick overview of your past-due retainers, proposals, and invoices across all your projects? The "Document" panel shows you all sent documents that need to be followed up with, or that are past due. You have the ability to follow up or re-send them for payment or view more details directly from the panel. Note: that documents are sorted by due date. The payments panel displays total paid and open retainers, proposals, and invoices across all active projects. To see a full list of payments, click the "Projects" icon in the left hand navigation, select "All Projects" at the top of the list, and then click on the "Payments" tab. 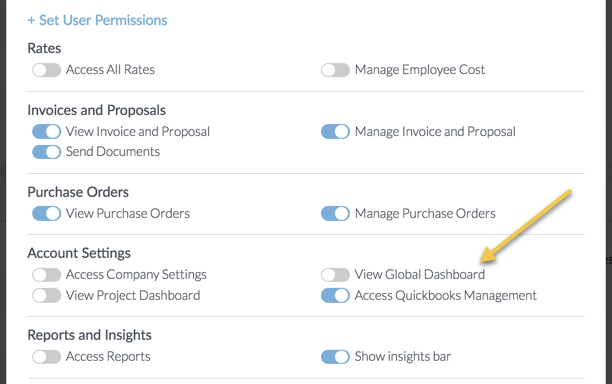 Only team members who have the "View Global Dashboard" permission enabled in their account will have the ability to view the dashboard. By default, this is disabled, but can easily be turned on by going to "My Account" --> "Team/Rates", once there, simply click on the team members name, and then enable the "View Global Dashboard" toggle in the "User Permissions" section.